Lark's head knots are one of several types of knots used in beadwork. They are useful to add new thread or attach a pendant component to a necklace or cord. What you may knot be aware of, is that you can tie a decorative row of lark's head knots in order to cover a cord or component such as this metal ring. Many people are familiar with making a single lark's head knot. This tutorial will show you how to make additional lark's head knots to cover a component such as the metal ring in the picture or another cord - such as the loop for a bracelet or necklace closure. You can make this with almost any type of jewelry making cord. 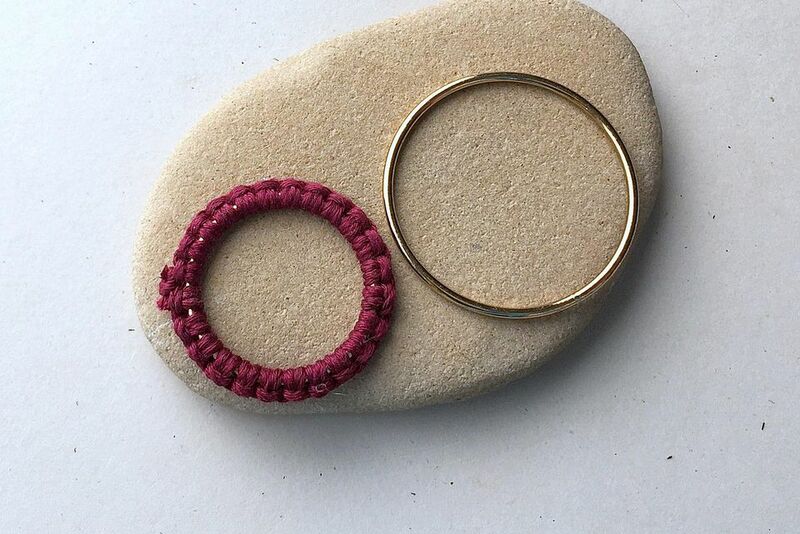 I am using hemp cord and a metal ring that is about 1.5 inches in diameter. To make a similar covered ring, start with about 3 feet of cord. Tie a lark's head knot by folding the cord in half, placing the loop against the ring and putting the cord ends through the loop. To start the second lark's head knot, take one side of the cord and put it over the front of the ring. You need to do this somewhat loosely because you are going to be pulling the cord through the ring and through the loop between the cord and the ring. While holding the cord in place, pull the end of the cord through the ring and then up through the loop formed with the cord. This will form the first half of the lark's head knot. Tighten the first half of the knot by pulling the thread firmly. Slide the knot next to the first lark's head knot you made. To start the second half of the lark's head knot, you will go in the opposite direction. This time you will bring the cord over the back of the ring. Hold it so it forms a loose loop that is large enough for you to pull the cord end through. Complete the second half of the lark's head knot by pulling the cord through the ring and then up through the loop you just made. Complete the lark's head knot by pulling the thread tight and pushing the knot close to the others on the ring. You will now have two lark's head knots side by side. Continue adding lark's head knots in the same way until you have made them half way around the ring. Make sure you bring the cord over the ring for the first half of the knot and behind the ring for the second half of the knot. You will notice that the knots will not be even (they will twist) if you accidentally go the wrong way. Knot the other half of the ring until it is fully covered. When the two ends of the cord meet on the other side, tie off the threads with a square knot. Trim the cords close to the knot and add a drop of glue if desired. This can also be done by adding beads before making each half of the lark's head knot.